The events leading up to the declaration of Native American Heritage Month began in the early 20th century. That's when the American Indian Association declared the second Saturday day in May as American Indian Day in 1915. No formal national recognition of the day was forthcoming -- so that same year a Blackfoot Indian, Red Fox James, rode to the White House on horseback to present the endorsements from 24 state governments -- but again, without success. for designation of a day to honor American Indians. The following year, the governor of New York finally recognized the importance of such a day and declared American Indian Day as the second Saturday in May in 1916. Several states followed, but no national recognition of the contributions of native Americans would be decided upon until decades later. It was only in 1990 when President George H.W. Bush approved a joint resolution that designated the entire month of November as "Native American Heritage Month". It was a landmark bill honoring America’s tribal people and gave Native Americans a national platform on which to express their pride as the First Americans. Today, Native American Heritage Month is observed with local, regional and state ceremonies, as well as dance performances, food tastings and other cultural events. That includes special exhibitions that celebrate the rich history and culture of American Indians at the National Museum of the American Indian in both New York and Washington. 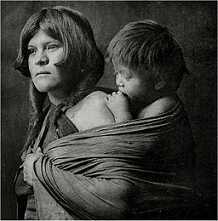 A rich photographic record of Native Americans also endures today in such works by photographers as Edward S. Curtis and Hermann Heyn that vividly portray the pride and humanity of Native Americans of the Old West. 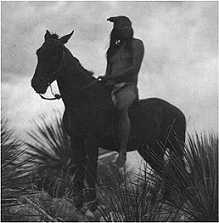 as a rich pictorial record of the pride and humanity of Native Americans of the Old West. 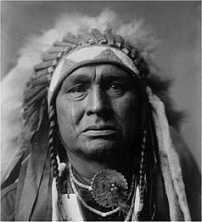 took studio portraits of local Dakota Sioux that are now preserved in the Library of Congress. National American Heritage Month - A nod from the U.S. government featuring a schedule of events, a history of the day & related resources. Teaching Young Children about Native Americans - From the Eric Digest. offering teaching suggestions, positive strategies and lesson plans, related references. Index of Native American History Resources on the Internet - Here's an excellent resource to related sites by U.S. region, Canada and Mexico with historical timelines, photo and picture archives, and suggested reading.